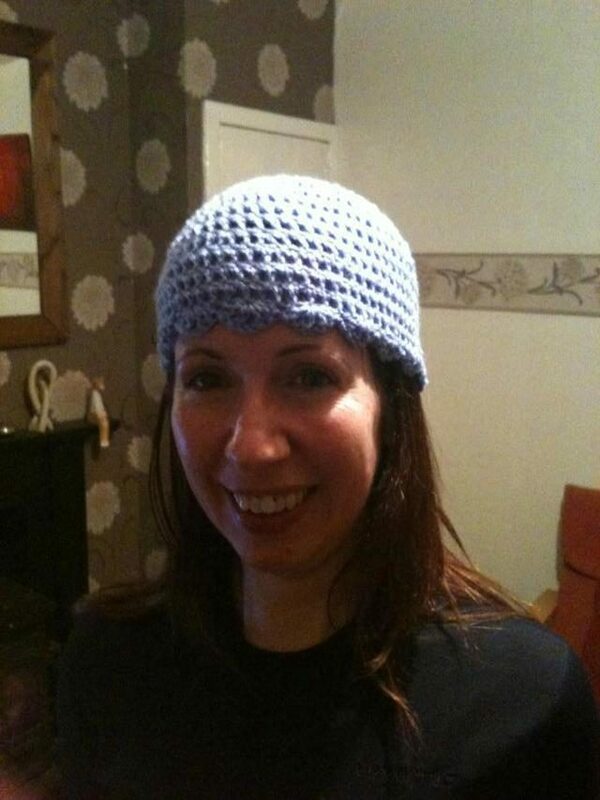 Beth Currie fell in love with crochet after moving to Scotland. 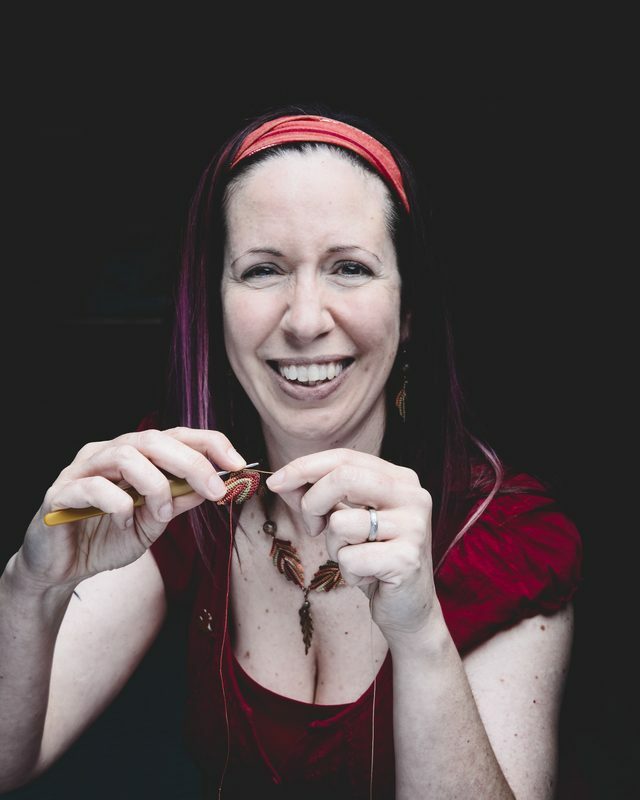 She began working with thread, making unique and beautiful crochet jewelry, and ultimately opened up Red Squirrel Crafts to share her work with others. In this interview we learn more about her work, how it balances with the rest of her life and how it all goes to help red squirrels. I taught myself to crochet in 2012 after we moved to Scotland. I never thought back then that I would end up making a career of it! We had taken a sabbatical from work after moving here and were just settling in, enjoying exploring our new surroundings and taking some time out. I wanted to try something creative and new that I could do on the winter evenings and rainy days when we weren’t out and about. Crochet was something I had always fancied having a go at, and we were at a friend’s house having coffee when I mentioned I was thinking of trying it. She is a very crafty person and also very kind hearted, and straight away donated me some yarn, a 4.5mm hook and a magazine with some simple crochet patterns in it. I was off! I taught myself using YouTube videos and online patterns, and I’ve never looked back! What was the first thing that you crocheted? 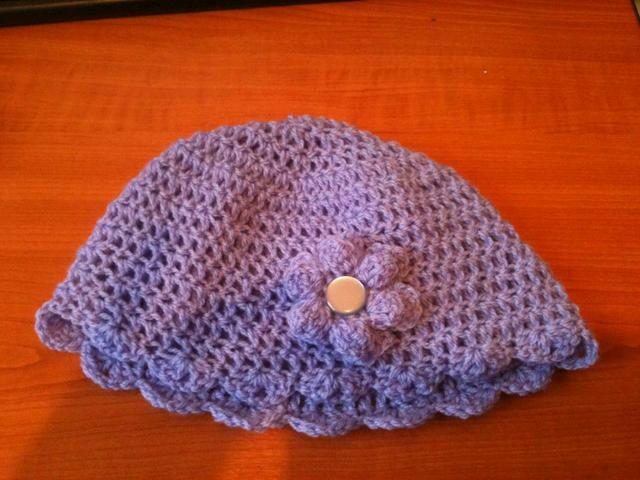 The first thing that I ever made was a simple beanie hat in lilac (images above and below). I was so chuffed with it! I experimented with various hats, scarves, bags and became totally addicted to the craft. 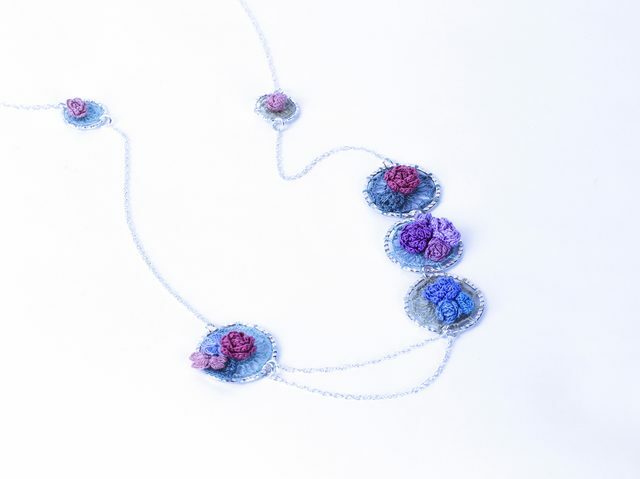 So then what inspired you to begin working with thread and creating crochet jewelry? 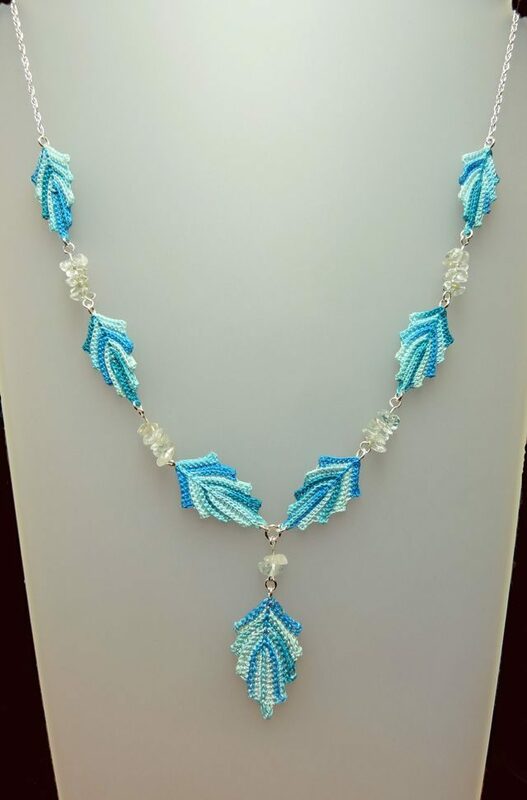 It really first started when I was browsing online for crochet ideas and came across a YouTube tutorial for a simple beaded necklace using chain stitch. 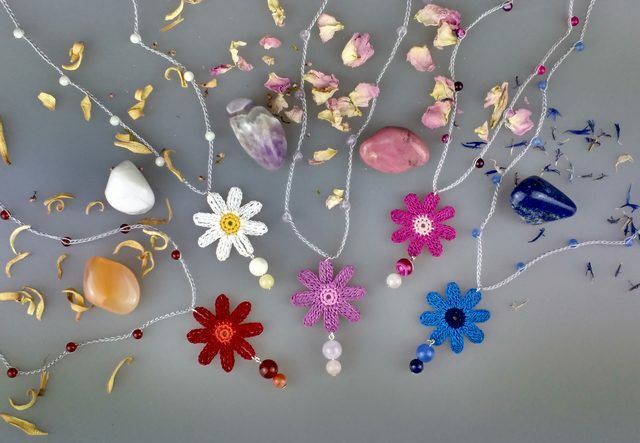 I loved the idea as I was enjoying crochet so much, and also loved jewellery – in fact, making and selling jewellery was one of the things I had thought about doing to earn money after leaving accountancy work! So I bought myself a smaller hook (1.75mm), some metallic thread, a few beads and had a go at it. My first effort was not great – I learned later that metallic thread is really not right for this work as it doesn’t have the weight to hang nicely. 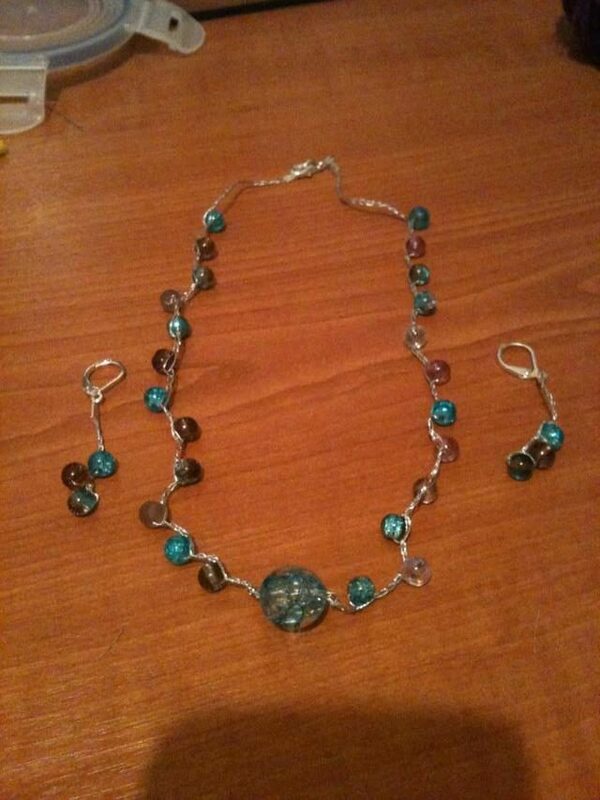 I also learned that large beads like the one I put in the centre of this necklace don’t really work! But this was where it all started! 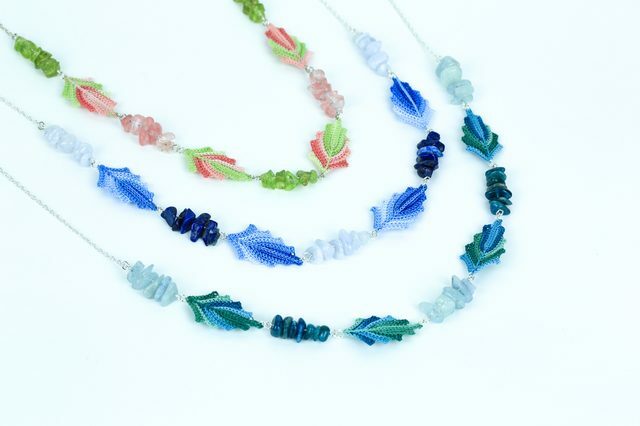 See more cord and bead crochet necklaces here. 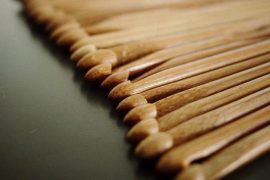 What tips can you offer to someone who has never crocheted with small hooks? Just practice! It’s like anything new – it feels awkward to begin with but you get the hang of it. Go smaller in stages; don’t try to go straight from a 4.5mm hook to a 0.5mm or you will definitely struggle! Instead, try making something with size 10 cotton and a 2mm hook, then if you want to go smaller try size 20 and a 1mm hook, and then if you want to go even smaller, try size 80 and a 0.5mm hook! Pick something small, simple and easy to crochet – a flower motif, for example – something that you have made before in a larger size so that you are familiar with the pattern, and experiment with smaller hooks and finer threads to get the hang of it. What has been your very favorite crochet piece ever? Oh, gosh, it’s so hard to pick a favourite! I would probably have to go with my Tiny Leaf collection. I just love leaves and make so many of them but the delicacy of the Tiny Leaves and the gorgeous colours I use may be my favourite. 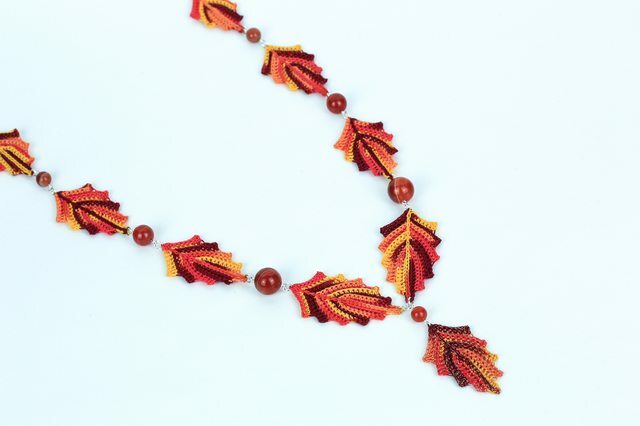 I use size 80 cotton and a 0.6mm hook to make the leaves, and I combine them with gemstone chips. 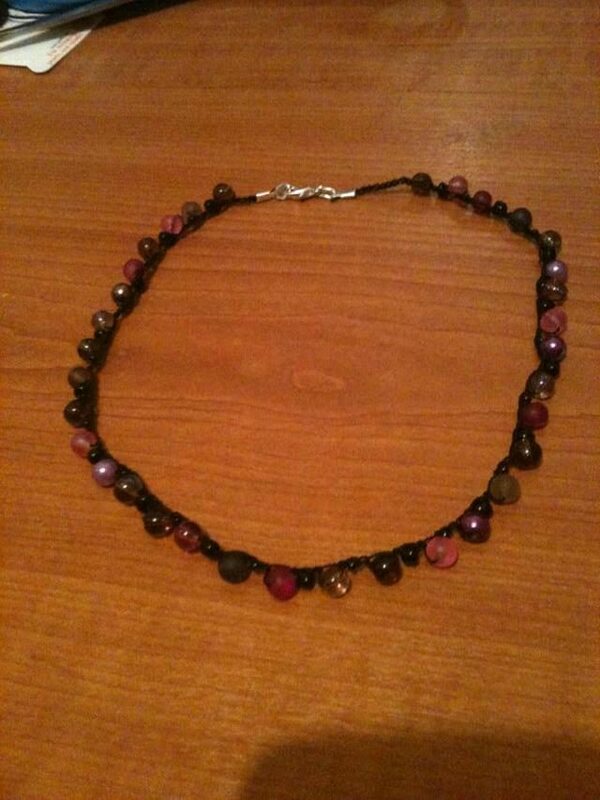 I love the fact that due to the variegated thread and the natural gemstones every piece turns out slightly different. What is your process of collaboration like when working on commissioned pieces? 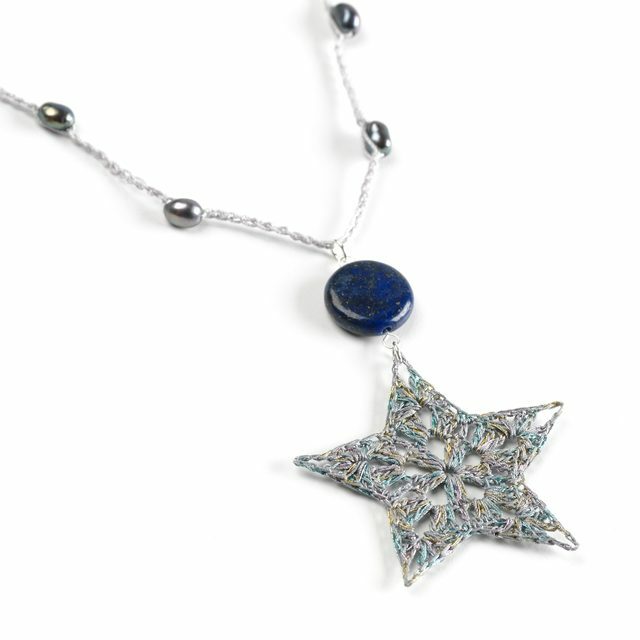 You downsized your life and changed your career from accountant to jewelry maker (full story here). What benefits have you experienced as a result? Oh wow, so many it’s hard to know where to start! I can’t overstate how great it is to do something you love for a living. To anyone thinking of ditching a “day job” you hate, I would say DO IT! You won’t regret it! We now live in a smaller house and have a lower income but are so much happier than we were! I was constantly stressed as an accountant and worked longer hours than I wanted to. Now I have a much better work / life balance. I love the general advantages of being self employed – being able to organise my own hours, and take days off to suit me (which is usually when the weather is good!) rather than having set hours and set days off. And being self employed doing something creative that I really enjoy is fantastic. I also love that I get to work with other like minded people. I am part of a couple of artist co-operatives where we rent space and sell our work together, and I have made some amazing friends through my work. Don’t get me wrong, though; it’s not all sunshine and giggles. It is very hard work and there are sometimes there are not enough hours in the day. When you run a creative microbusiness like mine you have to wear all the hats – making, designing, marketing, selling, updating websites, etc. etc! It’s a juggling act but I would not want to do anything else. Life is short and we spend so much of it working – it’s important that work is something you love! 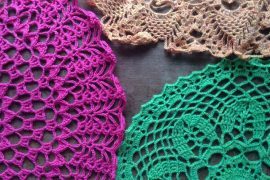 What benefits has crochet itself offered? I still just love the process of taking a ball of thread and turning it into something beautiful. 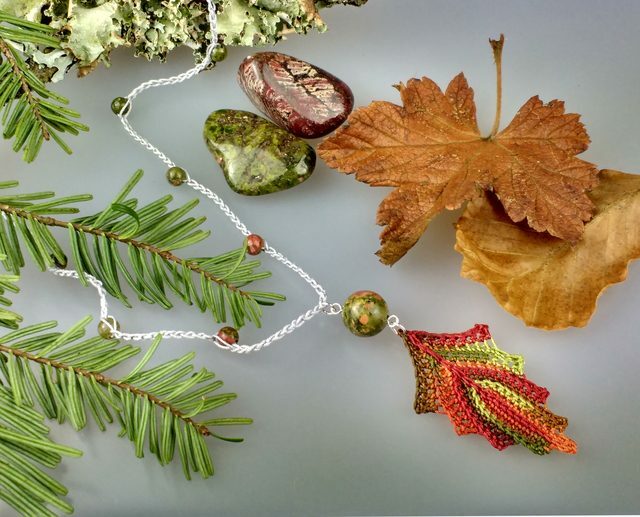 I must have made thousands of crocheted leaves by now but I still get a buzz from seeing a finished one turned into a piece of jewellery. I find I can lose myself in what I am doing and become totally absorbed in it. I think it’s very good for me from that point of view, as I have a tendency to be quite scattered and easily distracted! If I won the lottery tomorrow (which I won’t ‘cos I don’t do it!) and didn’t need to work any more I would still continue to make crocheted jewellery – I just love it. I am a naturally impatient person and I have huge perfectionist tendencies! Crocheting for a living has been very good for me because it gets me out of my head and working with my hands. Working on new designs teaches me patience – I have learned to accept that sometimes they just won’t work at all and that’s ok! – and helps me to be less of a perfectionist. You were diagnosed with glaucoma in 2015. How has that experience affected you and has it had any impact on how you view your crochet work? In simple physical terms, I’m happy to report that it hasn’t affected me at all. My eyesight is still absolutely fine and the only tangible difference to my life since my diagnosis in 2015 has been the addition of my daily eye drops before bed. Having glaucoma has definitely affected me emotionally and mentally though. When I was first diagnosed I really was very up and down emotionally – one minute telling myself everything would be fine and it was no big deal, the next minute thinking of the worst case scenarios and the possibility of losing my eyesight, which was absolutely terrifying. I especially thought about how my crochet work is so tiny, and the thing people say to me most often when I’m out and about at fairs is, “oh, you must have good eyesight!” The thought of not being able to do my tiny crochet work anymore was very upsetting. However, after some journaling and working through my fears, I came to see my diagnosis as a positive thing. My eye drops act as a daily reminder that life is short and to be fully embraced, every minute of it. So since the diagnosis, I have really changed the way I live, and am determined to make the most of every day and appreciate the amazing gift of eyesight! Now I say yes to things that I know will inspire me and make me happy, even if they are outside of my comfort zone, or require me to make a bit of an effort. I also say no to things that drain me and make me unhappy, set aside time for self care, and make it my number one priority to look after my health. Last year I invested in an incredible online course which helped me to get into a daily practice of mindfulness, and for the first time in literally years I feel good about my body and treat it with respect, nourishing it with healthy food and exercise and treating it with kindness. Now I meditate every day, eat more fruit and vegetables on a daily basis than I used to in a week, and I exercise regularly. In terms of my creativity and crochet work, I think it has inspired me to be braver and put myself out there more – life is too short to be scared to try things! That’s such a great point of view! How have you gone about growing your crochet jewelry business? What are the best and toughest parts? I started off doing local craft fairs and it has really gone from there. Now I try to focus on doing fewer, but bigger events each year – this year I will be doing Crafts for Christmas shows in Glasgow and Birmingham. I sell in various shops and have gradually added more stockists as my business has grown. I also do exhibitions and arts trails locally which get a lot of tourist footfall, so that is a great way of getting my work in front of a new audience. Plus I have an online shop on my own website. I use Facebook and Instagram and am in the process of getting an Etsy shop set up. It is hard work growing the business and making a living from it. Because my work is so unusual, it doesn’t appeal to everyone – and that’s fine! – but it means that I have to work hard to put it in front of enough people, to find the ones who really appreciate and love what I do. One of the toughest parts is that all these things take up a lot of time! Trying to post regularly on social media, photographing my work, listing items on Etsy – all these things take lots of time and it’s a juggling act to do enough of this stuff which I need to do to grow my business, but also have enough time for designing and making. In an ideal world I would just sit and crochet all day and money would magically roll in! But we all know that is not how it works! The best part is when I meet people who just “get” my work and fall in love with it. I had a lovely message recently from a lady who had bought one of my chokers for her wedding and said how much she loved it and how perfect it had been with her dress. That just made my day! What are the pros and cons of selling your work at craft fairs vs. selling in pop-up shops and galleries? Craft fairs are much harder work as you are there yourself selling your work. Because I live in a very remote rural area, most of my fairs involve a lot of travel as well. My stall takes a good hour at least to set up, so a craft fair running 10-4 will often actually mean I leave the house at 7 am and don’t get home until 7 pm. So from that point of view, I much prefer selling in shops and galleries where it’s not taking up so much of my time. On the other hand, fairs are brilliant because I am there myself and customers get to see me working; I usually have something with me on the go to demonstrate. I would say that I probably sell better at fairs because of this – customers like to meet the maker in person and get that connection with them. How has your business changed since first starting it? I have got more focus now, my designs fit together well – they are nearly all nature based – and I feel more confident in my work and where I am going with the business. 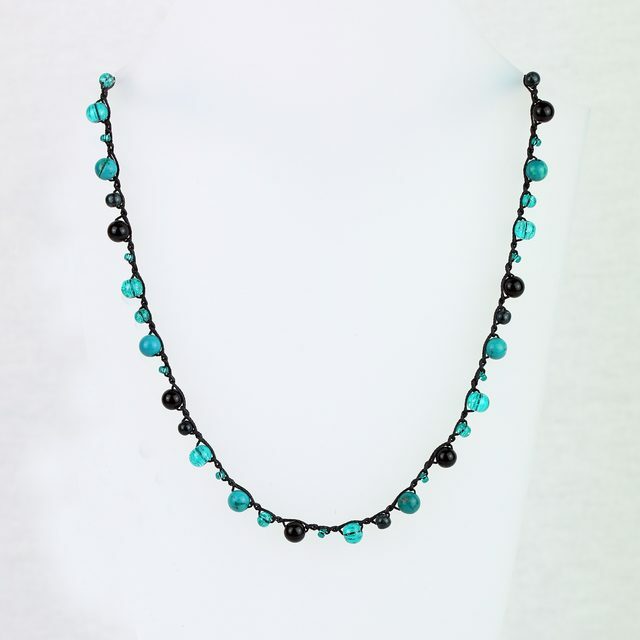 In what ways does your husband support your crochet jewelry work? My husband Dave is a star! He is a photographer himself, so we have a gallery at home to showcase our work, which he built himself last year. He helps me with my own product photography, too. He is also really supportive when I’m doing big events, helping me carry equipment in and get set up. Before we wrap up, can you tell us a little more about how some of your profits go to help red squirrels? Yes! I adore red squirrels which is why I named my business after them. Before I moved to Scotland I had never seen one before and I just fell in love with them – they’re so cute!! When I first started the business my intention was to “adopt” a red squirrel every so often to give them a share of my profits. However having spoken to the Scottish Wildlife Trust who are in charge of the red squirrel conservation, they prefer regular income to one-off donations like this, so now I make a regular monthly donation by direct debit. Dave and I also volunteer our time every year helping with the annual squirrel survey which is an important part of the conservation efforts locally. I have a monthly newsletter that I send out with all my news so if you’re interested in keeping up with what I’m up to you can sign up here. Thank you for sharing your work. Your pieces are absolutely gorgeous! I’m so inspired, I have made some jewelry in the past. I’m going to dig out those tiny hooks. PLEASE. Write a book, that will be used for years and years. 50+. If it had basic instructions and pictures of all your work, it would inspire so many. I’m 68 but I see a generation of young women who will follow in your footsteps. Inspired by your work.